I hope you have enjoyed party week, I hadn't realised how much thought I had put into it until I wrote it all down, but I guess thats the beauty of having a blog you can look back at what you've done and feel a teeny bit proud. I have already had a request for the tassel garland which I am excited about, I had to stop myself yesterday afternoon from going out and stocking up on new supplies. Anyway back to business, here is the last post for the week (I know I could do with one of these tonight), and it only seems right that I finish with a drink. I the only downside to holding a party at home is there is no-one to mix cocktails for you, but a party without cocktails wouldn't have been right. We decided on simple drinks that had a vodka base and could easily be made in large batches, this lemon delight was an unexpected success and I think it'll become our drink for nights out to come as we're still talking about it nearly two weeks on. Add ice and a good slug of vodka to a jug (for non-drinkers leave out the vodka). 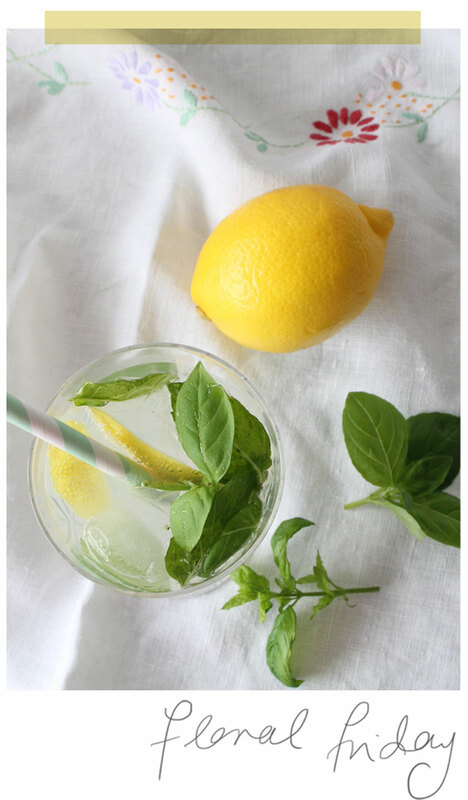 Top up with fancy French or Italian lemonade and then add mint, basil and lemon rind, give it a little mix (not the pop group) and pour into glasses - enjoy (responsibly, its quite lethal)! Catching up on my blog reading. Great 'party week'. Brilliant idea I might steal (although no parties planned any time soon). Cocktail sounds great.